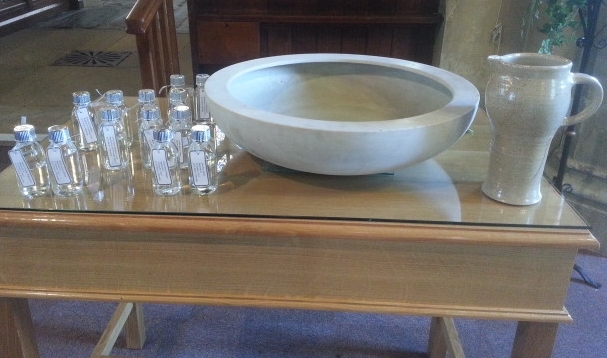 Sunday 1 June was the occasion this year when Baptism families were invited to come and collect the small bottles of baptism water, reserved from the font after their babies’ christening in the past year. Together with the baptism candles, these are physical reminders of the invisible grace received through the Sacrament of Baptism. Used imaginatively, they provide a way into carrying out the promises parents and godparents made at the baptism. Don’t put them away: leave them out in view; children ask questions about everything and they will give parents the opening to talk about why they were baptised and what it means. Later this year St Mary’s is planning a “Difficult Questions” evening for parents of small children. An expert panel will be on hand to try and help with answering those difficult questions that children spontaneously ask about life, death, trust and faith. The event has been planned for October and details about it will be published both here and in Tidings magazine. This entry was posted in News and tagged baptisms, parents.godparents. Bookmark the permalink.